Following a three-month pre-convention discussion period that saw members submitting some 70 written contributions, Socialist Action’s elected delegates, along with members, supporters, and international guests, assembled in Minneapolis, Oct. 12-14, for the party’s 18th national convention. The convention opened with a critical evaluation of the Fourth International (FI), in which Socialist Action fraternally participates alongside a small minority of parties that have challenged the long-term and ongoing political and organizational degeneration of this formerly revolutionary world party that traced its origins to the politics of the 1917 Russian Revolution and the principles pioneered by Lenin and Trotsky. Our delegation at the FI’s February 2018 World Congress aimed at re-orienting the FI to its historic rejection of coalition capitalist (“popular front”) politics and imperialist wars, unconditional support to the right of oppressed nations and peoples to self-determination, and the construction of disciplined revolutionary parties on the Leninist model aimed at the construction of a world socialist order. Today, most of these founding programmatic principles have been abandoned. FI sections largely shun the construction of Leninist parties in favor of participation in “more influential” reformist “broad parties” with an electoralist orientation. In opposition to this trend, Socialist Action has aligned with a small number of opposition formations inside the FI while maintaining relations with various expelled currents and others outside the FI that are open to discussions and collaboration. The major text adopted at the Minneapolis convention was the Draft Political Resolution, aimed at analyzing and engaging Socialist Action in the fightback challenges to the ever-deepening world capitalist crisis and its effects on working-class life in the U.S. Here we present a summary of this resolution. Trump’s withdrawal from the Iran nuclear agreement and from the nearly worthless COP 21 Paris climate accords, his ultra-reactionary racist immigration policies—separating detained and imprisoned parents from their children—his praise for the Supreme Court’s approval of the “constitutional” right of a baker to refuse to prepare a wedding cake for an LGBTQI couple, his proposal to his National Security Council to increase the U.S. nuclear weapons stock “100 fold,” and his most recent order to establish a sixth arm of the Pentagon to militarily “defend” U.S. “interests” in outer space—to mention a few of his crude affirmations—combine to demonstrate that on virtually every front his twisted politics have a rational core. They advance what he perceives as policies to protect a weakened U.S. capitalism from its competitors abroad, while advancing its interests against U.S. workers at home. Global capitalist competition is a completely unavoidable aspect of the system of private profit. As competition results in new innovation, and automation temporarily increases the rate of profit for the innovator, these gains are offset again by the rapid adoption of new technology by competitors, resulting in the fall of profit rates. In their desperate struggle to fight the falling rate of profit, capitalists try to reduce costs by attacking trade unions and workers’ gains on the job and generally cutting social benefits such as education, medical care, and pension allocations. Refusing to accept responsibility for the massive environmental damage caused by cutthroat capitalist competition and transferring production to low-wage, unregulated areas both within and outside their own countries are likewise inherent in the system. Yes, Donald Trump is a “moron” in the “unsavvy” political sense only. The moron term was first coined by his former and fired Secretary of State and former Exxon Mobile CEO, Ross Tillerson, when Trump proposed to the National Security Council a hundred-fold increase of nuclear weapons. Yes, Trump is a billionaire businessman—an overtly racist, sexist, anti-immigrant, climate crisis denying, detention center/concentration camp crusading, homophobic, Islamophobic, warmongering, imperialist beast. But there were nearly zero objections when a bipartisan Congress gifted $1.5 trillion in tax relief to the corporations and banks of the ruling rich, a fact that in and of itself enabled bourgeois economic analysts to post and predict some figures that indicated a modest but one-time uptick in otherwise stagnant GDP figures. Similarly, there were few, if any, objections when Congress boosted annual military spending by an unprecedented $80 billion, an amount exceeding even Trump’s initial request. We note here in passing that the $80 billion increase exceeds Russia’s total annual military budget of $50 billion, as compared to the U.S.’s budgeted $1 trillion for overall war purposes! On June 21, 2018, the U.S. Senate, by a vote of 85-15, approved this military budget. U.S. threats against China are a classic example of fundamental imperialist contradictions and new rivalries. China’s entry into the World Trade Organization in 2001 was conditioned on its respecting foreign corporations’ intellectual property rights—that is, agreeing not to compete by transforming its primitive factories via state-of-the-art technologies, which the U.S. today insists are protected by U.S. patents (“inviolable” intellectual property rights). As a result, for close to two decades and until recently, the level of Chinese labor productivity lagged far behind most capitalist nations. But this is rapidly changing. With regard to an increasing number of key commodities traded on world markets, China’s productivity levels are rapidly rising—closing the technology gap and thus posing a threat to U.S. corporate interests. Trump’s list of proposed tariffs on Chinese imports includes 1102 categories of goods—concentrated in high-tech industries like nuclear reactors, aircraft engine parts, ball bearings, motorcycles, and industrial and agricultural machinery. These are precisely the categories in which China has employed the advanced robotics and production technologies that Trump claims were “stolen” by Chinese corporations. In the minds of U.S. capitalists, China was to be permanently relegated to using inferior technologies while providing the world’s cheapest and largest labor pool. Further, U.S. corporations hoped to unilaterally exploit the emerging mass Chinese market, where perhaps some 300 million or more of China’s population of 1.4 billion people are able to purchase U.S.-manufactured commodities. Needless to say, the Chinese ruling class, as it introduced competitive technologies, had no intention of being banned from the markets in its own country. Obviously, neither China nor the European Union nations—nor any other “self-respecting” big capitalist entrepreneurs—intend to remain permanent second-rate players. Socialist Action’s convention approved a new text entitled “China: A New Imperialist Power.” China, built on a foundation of monopoly capitalism, is a major capital exporter that fundamentally exploits workers at home and across the world. Its economy exhibits highly uneven development, with advanced and highly productive regions alongside impoverished and underdeveloped ones. Its military is increasingly advanced and is deployed to support the interests of Chinese capitalism worldwide. China is a major player in most theaters across the world today and is continually seeking to expand its already significant influence globally. Socialist Action also adopted the position that Russia is an imperialist nation, but with considerably less weight than China in the world economy and in many other respects. Today, we see a deepening worldwide political polarization, often with the emergence of openly racist, anti-immigrant, right “populist,” or neo-fascist movements—as in India, Japan, and Europe. Trump, Macron, and May seek similar economic and social objectives, but with sometimes more restrained rhetoric. All of these heinous developments have their origins in a crisis-ridden world capitalism wherein sections of the ruling elites aim to deflect blame for the overall systems’s failures onto immigrants, oppressed nationalities, women, the LGBTQI community, religious groups, or other sections of society or nations that they choose to scapegoat and demonize for their own divide-and-rule objectives. Any significant explanation of Donald Trump’s election to the U.S. presidency must include mention of the widespread rejection of the Washington, D.C./Wall Street associations of Democrat Hillary Clinton. Many workers and sections of the middle class turned to Trump, who postured in his electoral campaign as an anti-establishment “populist.” His rallies aimed at mobilizing the racism and xenophobia deeply promoted by U.S. capitalist institutions. At the same time, wide discontent over the Democrats’ eight years of broadly imposed austerity, multi-trillion-dollar bank and corporate bailouts, unprecedented mortgage foreclosures, mass deportations, endless wars, massive expansion of the racist prison-industrial complex, police violence and murder, offshore drilling, pipeline extension, fracking and other elements of environmental destruction—to name a few of the measures implemented to advance overall capitalist interests—helped to inflate support to Bernie Sanders’ candidacy in the Democratic Party primaries, and later resulted in many abstentions in the general election. On the other side of the international equation, we see the emergence of important working-class formations and mass mobilizations aimed at resisting austerity and other encroachments, especially affecting young people. Spain/Catalonia, France/against Macron’s new Labor Code, Britain/Corbyn, South Africa/NUMSA, Haiti/rebellions against IMF austerity, the U.S./anti-Trump post-election mobilizations for women, immigrants, opposition to global warming, Poland and Ireland/mass pro-abortion rights mobilization are but a few examples. In the absence of clear alternatives led by deeply rooted socialist currents aiming at a definitive break with capitalist austerity and politics, we are witnessing the limited rise of initial efforts to find a path forward. The gap between the frustration and anger against austerity measures and the still low level of fightback efforts could potentially close rapidly. The eruption, seemingly out of the blue, of statewide teacher strikes—the “Red State Rebellions” in West Virginia, Kentucky, Arizona, Oklahoma, and North Carolina—may well have been the heat lightning to spark qualitatively broader and effective examples of resistance, portending a fundamental change in the present negative relationship of forces. The teachers’ strikes provide lessons to workers everywhere. They include the critical importance of union democracy, defiance of bureaucratic sellout union misleaders, solidarity with and fighting for demands to advance the well-being of all public employees, exposure of capitalist austerity measures that transferred public state funds to the private sector, establishing organic connections with and championing broad community class interests, lengthy and coordinated statewide strikes, and more. On the negative side of the balance sheet, the strike actions proved to be significantly limited by the subsequent decision, encouraged by the NEA and AFT tops, to run some 400 teachers as Democratic Party candidates in the 2018 elections. This decision had the effect of subordinating any further unleashing of teacher power to the reformist electoral arena. The absence of clear working-class or trade-union-based alternatives in the electoral arena, coupled with the still low level of independent organization of broad social movements in the context of the Trump administration’s reactionary policies, will no doubt result in a concerted rush of the reformists of every stripe to the Democratic Party. We saw this in the lead-up to the 2016 presidential elections—with the Sanders campaign, along with the Greens as well as the diehard “lesser-evil” Clinton supporters, absorbing much of the reformist left. Socialist Action’s decision to run our own candidate for the presidency, even as an extremely modest propaganda effort, stood us in good stead with regard to the education of our ranks along with radicalizing layers who were beginning to learn the lessons of independent working-class politics in the electoral arena. With regard to all the vital social movements that fight racism, sexism, environmental catastrophe, and LGBTQI and gender discrimination, we should fully expect a concerted ruling-class effort, led by the Democratic Party, to channel them into a coordinated effort to “re-capture the Senate and House from Donald Trump and the Republicans.” The upcoming election cycles will undoubtedly see the Democratic Party, with their associated reformist allies from every quarter in tow, posing the “Dump Trump” refrain as the only way to save the nation from catastrophe. To accomplish this, the Democrats “big tent” strategy is to politically present themselves not as a leftist alternative to the Republicans but rather as “moderates” or “centrists” (in the capitalist meaning of these terms) so as to win voters across the political spectrum—that is, as close to the right as possible. Our response to this moment of relative calm, this gap that is punctuated by periodic huge protests against the myriad forms of social injustice, requires patience and always wholehearted participation aimed at meeting the best activists and introducing our independent methods of struggle in preparation for the time when teacher/Red State-type actions again become the order of the day, but this time around offering the potential of more definitive breaks with previously sacred capitalist institutions. Here we note another important example of the receptivity to socialist ideas. Alexandria Ocasio-Cortez’s congressional primary victory in the Bronx and Queens boroughs of New York City temporarily shook the Democratic Party hierarchy. They learned too late that their machine-dominated apparatus and six-term Democratic Party incumbent were insufficient to defeat a young Latina of 28 years who campaigned on a broad-ranging platform of progressive and radical demands, coupled with her open association with a Bernie Sanders’ version of democratic socialism and open membership in the Democratic Socialists of America, as well as a host of new Democratic Party front groups collecting funds for “progressive” Democrats. Sadly, much of the “left” today remains once again mired in “lesser evil” illusions that capitalism’s historic “graveyard of social movements,” the Democratic Party, can in any way be converted into an instrument of working people. Despite her misguided association with the Democratic Party, however, we see Ocasio-Cortez’s campaign as confirmation that socialist ideas are increasingly finding a receptive ear among broad layers of the population. This data begins to create an accurate gauge of the anger, frustration, and hatred of the austerity measures imposed by capital against workers. The past decline in support for unions, we have always asserted, could be largely attributed to the class-collaborationist bureaucracy’s polices and never to the efforts of working people to improve their lives by collectively organizing. Union power derives fundamentally from the will of workers to fight, and never from the capacity of unions to fund their struggles from member dues. In this context, the anti-union U.S. Supreme Court decision in the case of Janus vs. AFSCME, in which the court ruled on June 28, 2018, that union agreements to have employers deduct agency fees from employee paychecks and forward the money to the unions are “unconstitutional” is far from a definitive defeat. Two years after the promising rise of the Black Lives Matter movement, the deep anger and hatred of the assaults launched by “the system” continues, along with a concerted fightback. However, the struggle for Black liberation exhibits a tilt to Democratic Party electoral politics that is similar to what we have seen in a broad range of social movements. In the face of ever-mounting attacks on every aspect of Black, Latinx, and Native American lives, there are no clear currents that seek to organize a break with capitalist politics. And this is in the face of hard facts demonstrating that the horrors of state and police violence, of the deepening imposition of degrading poverty and a generalized deterioration in the quality of life continue unabated. At the same time, the receptivity of Black and oppressed communities, especially young people, to socialist and related radical ideas is undeniable, as is the opportunity to win the best fighters to our party today. The United Nations climate data in October 2018 put the onset of permanent, irreversible, and catastrophic damage at some 12 years away! This data is reported against the background of a U.S. government administration of climate deniers. “Environmental Protection Agency” top officials systematically gut regulations that place some limits on corporate environmental degradation projects that threaten human health and safety—if not the viability of life on earth as we know it. In that context, the vast panoply of environmental organizations are turning to the elections, presenting a limited set of demands that are consciously designed to complement, not oppose, the nearly worthless positions of the Democratic Party. We will continue our participation in the environmental movement, regardless of its reformist leadership, looking for every opportunity to advance a program that challenges the private for-profit core of the fossil-fuel energy complex, with the objective of winning the most serious forces, and, in time, the broad movement, to an independent mass-action orientation. At present, the movement against climate change lacks focus and direction. But as we have seen with regard to the massive national mobilizations against the Dakota Access Pipeline project and the inspiring solidarity with Standing Rock Native American fighters who paved the way in this struggle, the potential for qualitatively broader struggles on ever-increasing fronts is not far off. We note with enthusiasm the fact that leading groups like 350.org have increasingly incorporated a strong defense of immigrants and opposition to environmental racism as key planks in their platforms. We must also take advantage of the sophisticated discussion about the unfolding of disaster capitalism in Puerto Rico to drive home the need for eco-socialist solutions. We will continue to press for making “Nationalize the energy industry, under workers’ and community control!” a central organizing, transitional demand. With this demand, the climate change movement can be strengthened in multiple ways—by identifying the key obstacles in its path, by embracing its natural allies and unmasking its adversaries, by providing a strategy around which a fighting movement can coalesce, and by focusing its collective strength to strike a real blow at the very heart of the problem. This, along with critical demands for a just transition at top union wages for all displaced workers, will help the movement close the gap between the union bureaucracy’s view of jobs at any cost and the goal of a clear fight for a sustainable fossil-fuel-free energy system that all workers can see as a viable and necessary alternative to the present disastrous course. Immediately following Trump’s inauguration, five million women and their allies mobilized in Washington, D.C., and in cities across the country in perhaps the largest such mobilization ever. They mobilized to make clear to everyone that they rejected every aspect of Trump’s sexist rants and broad-ranging attacks on women’s rights. In the very act of mobilizing, the essentially self-appointed and largely media-approved handful of middle-class leaders saw that in order to bring out the maximum numbers possible they had to broaden their appeal to include demands for the LGBTQI community, immigrants, and oppressed national minorities. All the issues were fused in a way that all understood that to seriously defend women’s rights any serious effort also had to defend everyone’s rights. While the numbers were astounding, the turnout was in large part promoted by the Democratic Party and the corporate media with the early-on objective of turning all social movements into mainstream and electoral reformism—that is, bourgeois channels. The January 2017 mobilizations were followed by huge mobilizations everywhere on a wide range of issues, most encouraged by the corporate media and facilitated by local police departments and city governments. Most featured as speakers a range of Democratic Party officials or others who sought future office by catching the wave of anti-Trump sentiment. In a matter of a few months, however, the corporate media spigot was shut down tight and the mobilizations were largely brought to a halt as preparations began to refurbish the credibility of tarnished Democratic Party institutions and align its components to electoral “Dump Trump” perspectives and actions. The emergence of the #MeToo movement against sexual harassment is likewise an expression of a growing understanding that like racism, sexism, and sexual abuse are ingrained in capitalist culture and society, which marks women as inferior. When the hundreds of celebrity signers of a recent New York Times full-page advertisement acknowledged that they took inspiration from a communication they received from farmworker women representing thousands of agricultural workers who had experienced the same sexual violence, degradation, and abuse, no one dared to respond that these were “rare and exceptional” instances of sexual harassment. The abortion referendum victory in Ireland and the vote to decriminalize abortion in the lower house in Argentina, both won with unprecedented mass mobilizations and mass campaigning, reflect an incredible step forward for the global women’s movement. Both struggles were built on the pioneering fight to defend abortion rights in Poland. All are powerful examples of women’s and their allies’ ongoing capacity to extract critical gains even from nations where right-wing governments and parties or otherwise reactionary forces like the Catholic Church exercise major influence. In the U.S. the ongoing attacks at every level on abortion rights continue to erode previous gains. Once again, we point to the tactics that have proven their effectiveness in winning the most essential of women’s rights. United-front-type mass mobilizations of increasing magnitude and breadth make clear to all that women’s lives will not be subjected to the reactionary views of religious bigots and the state powers that they often influence or control. The past several years have witnessed important gains for the still persecuted LGBTQI community, especially in the beginnings of a cultural shift that has won recognition of the fact that human beings’ gender identity is expressed in a variety of forms. The increasing inclusion of LGBTQI leaders and the issue of gender equality more generally into the overall movement for women’s’ equality, as we saw in the January 2017 national mobilizations, is an indication of the growing strength of this important movement, as is the still-limited but important gains regarding gender identity, choice access to public bathrooms, and a range of legislative gains barring discrimination. But despite these gains, 2016 was the deadliest year for physical attacks against lesbians, gay men, and transgender women, according to the U.S. Justice Department—while granting that data for hate crimes against LGBTQI persons remain the most underreported of any category. Out of 6121 hate crime cases reported, 1076 were based on violence against lesbians and gay men, and 124 were based on gender identity. This represents an 11 percent increase. Fight for $15 and a union now! We have previously noted and enthusiastically supported the important mobilizations for increasing minimum wages to $15 per hour and the often associated demand for a union now. “Living wage” figures in cities across the country estimate that a worker earning between $15 and $23 hourly can barely make ends meet, depending on the cost of living. Increases in the minimum hourly wage have been registered in several cities, usually as a result of city or state legislation or ballot referenda. In most cases, the top-level wage of $15 per hour is to be phased in over the course of several years. Socialist Action’s new pamphlet, “How to Defeat Neo-Fascists, Racists and the Extreme Right,” authored by SA comrades who have been involved in the significant mobilizations when neo-fascists announced that they were coming to town, expresses our basic political and organization orientation. In Berkeley and Boston, a handful of these heinous types were met by 7000 and as many as 40,000 counter-demonstrators respectively. The mobilization was organized by united-front-type coalitions whose effectiveness was in direct proportion to their massive numbers. Here’s what we wrote in our new pamphlet: “Virulent racist and neo-fascist groups feed off the misery and economic uncertainty of the 99 percent that are the hallmarks of capitalism in crisis. “Militarists, chauvinists, racists, and neo-fascists blame all of societies’ ills on ‘the other’—some presumed ‘inferior’ country, culture, race, or ethnic minority that threatens the rest of us. The rightists carry water for the [wealthy] one percent by obfuscating the real source of the problems we face, by undermining solidarity, and by sowing divisions among the victims of the current economic and political onslaught amidst attacks raining down on us from our common oppressors. “Typically, the ruling rich keep the fascist threat on the back burner so long as the democratic charade they use to control the majority proves effective. At present, racists and neo-fascists are able to mobilize only small groups of adherents. However, we know from history that as a last resort, when the veneer of democracy can no longer hold opposition to their system in check, the robber barons will throw their weight behind the fascist movement in order to obliterate unions, left political parties, and other fighting organizations of the working class. Since the unprecedented massive immigrant rights mobilizations of 2006, effectively a nationwide strike against the proposed passage of the reactionary Republican-sponsored Sensenbrenner Bill, the movement for immigrant rights has expanded its scope and power. The historic 2006 strike mobilization was overwhelmingly supported by the vast majority of the nation’s 12 million undocumented workers. Today, the struggle encompasses mobilizations for DACA (the Deferred Action for Childhood Arrivals), TPS (Temporary Protected Status), immigration rights for Muslims, and now, for the elementary right of immigrant children to not be brutally separated from their parents when they enter the U.S.
A portion of a Dec. 18, 2017, article in Working Class Perspectives outlines the stakes involved in this critical struggle: Created by Congress in the Immigration Act of 1990, TPS was meant for people from countries going through environmental disaster and other extraordinary and temporary conditions or confronting armed conflict. Currently, the program is administered by the U.S. Department of Homeland Security. Following in the footsteps of the “great deporter,” Barack Obama, with some 2.5 million deportees to his credit, the Trump administration seeks to impose the next wave of punitive deportations in the name of saving jobs for U.S. workers, as well as other lies and racist rationalizations. From our viewpoint we begin and end with the perspective of championing the interests of all workers and uniting them in common struggle against the boss class. President Trump’s grandstanding negotiations with North Korea should not put anyone fearful of nuclear war at ease. For Socialist Action the starting point in explaining our views is our historic demand for the total and unconditional disarmament of the imperialist military U.S. nuclear behemoth. The U.S. boasts a nuclear arsenal of some 5000 weapons capable of delivery from virtually anywhere in the world. Its 1100 military bases in some 100 nations fuel a domestic arms market unprecedented in world history. In contrast, no other nation has more than a handful of military bases outside its borders. North Korea, with perhaps 5-10 nuclear weapons, has none. It is not far-fetched to predict that if North Korea discarded its nuclear weapons and related missile delivery systems, it would be invaded by the imperialist U.S., no matter what treaties might be negotiated at a particular time. Socialist Action rejects the decades-long demonization of the leaders of North Korea. As with all such corporate media promoted efforts, the demonization serves the imperialist purpose of justifying U.S. intervention and war. We say this regardless of our views on the capitalist leaders of North Korea or any other capitalist state—regardless of our view that any and all such leaders can only be effectively removed as a product of the organization and mass mobilization of the working masses themselves in the course of socialist revolution. With the coming to political power of the governments of Lula/Brazil, Morales/Bolivia, Kirchner/Argentina, Ortega/Nicaragua, Correa/Ecuador and Chavez-Maduro/Venezuela, none of these reformist or social democratic leaders and regimes, their rhetoric notwithstanding, contemplated a revolutionary break with capitalism. Whatever differences distinguished one from the others regarding the implementation of sometimes substantial reforms were subordinate to the fact that in all cases the essential social structures and institutions of the capitalist state remained largely intact. Unlike the Cuban Revolution of 1959, which culminated in 1961 when the Fidel Castro leadership nationalized bourgeois property “down to the nails in the heels of their boots,” none of these “revolutions” challenged capitalist property rights. Thus, whatever measures were implemented to temporarily alleviate the terrible conditions endured by the masses for many decades were incapable of securing permanent advances, as compared to Cuba’s revolution that ended capitalist rule. Our analysis of the inherent limitations of the “pink tide” capitalist governments and our advocacy of the absolute necessity for the construction of a working-class opposition led by a revolutionary socialist party have been a major Socialist Action contribution to the education of vanguard forces in the U.S. and abroad. Socialist Action advances the need for an independent, democratic, mass action, united antiwar movement. Our work in the United National Antiwar Coalition (UNAC), the leading antiwar coalition in the U.S., has focused on united-front principles. Our recent effort has been to join in initiating and helping to lead the April 14-15, 2018, weekend of coordinated national mobilizations centered on the demand to “End All U.S. Wars at Home and Abroad.” The call for actions was aimed at measuring the movement’s capacity to galvanize the broad opposition to the deepening U.S. government wars at home against working people and the inseparable U.S. wars abroad—from the Middle East to Africa, Latin America, and beyond. While April 15 was a valiant effort to re-ignite the antiwar movement, the modest turnout, with no citywide protests exceeding 1000 participants, informed us that the antiwar movement, despite massive sentiment against all U.S. wars, as with most social movements, remains relatively dormant. The convention approved general goals for Socialist Action’s national fund and subscription drives and established work fractions to facilitate the party’s participation in the trade unions and the antiwar, women’s liberation, LGBTQI, transgender, climate, and immigrant rights movements. A session was devoted to a debate on Syria and related issues. 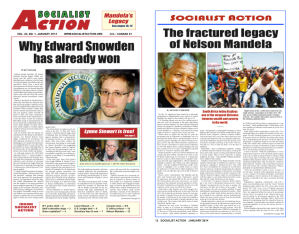 At its conclusion, delegates voted to reaffirm Socialist Action’s previously adopted views (see articles on this site). Notwithstanding our small forces, Socialist Action’s contributions to the building and strengthening of a broad range of social and political struggles are impressive. It is clear that the present period of intensifying attacks on working people has produced growing numbers who are more open to socialist ideas than in a long while. Our close attention to winning significant numbers of the most conscious of these activists to our socialist banner will prove invaluable as new opportunities emerge to engage working people in effective actions to improve their lives and advance the interests of all humanity. ← Join the Women’s Marches on Jan. 19: For a feminism of the 99 percent!